Thoracic facet joint syndrome is the least common variety of symptomatic zygapophyseal pathology. The middle back rarely suffers facet joint pain, since its natural design does not dispose the region to the same contributing factors that encourage the arthritic processes in the neck and lower back. However, thoracic facet syndrome can still occur due to less common scenarios and might create painful symptoms in some unfortunate patients. The upper back is generally considered to be the top 6 vertebral levels of the thoracic spine, starting with the cervicothoracic juncture of T1 and ending at the facet joining of T6 and T7. Meanwhile, the middle back is considered to begin at T7 and end at the thoracolumbar juncture with L1. Both the upper and middle back regions are part of the thoracic spine, which is unique from other spinal segments in that it is reinforced by the various bones of the ribcage. This investigative essay details less common cases of thoracic facet joint pain. We will detail why facet joint syndrome can occur in the thoracic spine and examine the typical symptomatic expressions of thoracic zygapophyseal pain. The thoracic spine is the largest section of the human backbone, consisting of 12 unique vertebral bones that begin at the border of the neck and end at the border of the lower back. The thoracic spine contains 2 distinct zones, colloquially called the upper back and middle back. Structurally, the thoracic spine differs from its neighboring regions since it is attached to the rib cage, which is a feature that adds incredible reinforcing properties to the upper and middle back regions. Facet joint syndrome is rare throughout the entire thoracic spine. However, when it does occur, it is generally located at or near the juncture with either the cervical or lumbar regions. These areas suffer increased activity and stress compared to the middle thoracic vertebral levels. Therefore, most upper and middle back facet joint issues are diagnosed near T1, T2 or T11 and T12. The further one moves inwards towards the center of the thoracic spine, the less common zygapophyseal pathologies become. However, it must be made clear that exceptional circumstances can cause facet joint problems at any area of the thoracic spine. Thoracic facet pain is rarely caused by the typical degenerative processes that enable it elsewhere in the spine. The thoracic region is not immune to degeneration, but its organic design and structure make it less susceptible to stress and deterioration. After all, the thoracic region is built for support, protection and stability. The region does not have to bend or flex as do the cervical and lumbar zones of the human backbone. Additionally, the added bone mass of the ribs provides fantastic support for this region and also helps to regulate movement from one vertebra to the next, taking stress off the facet joints. 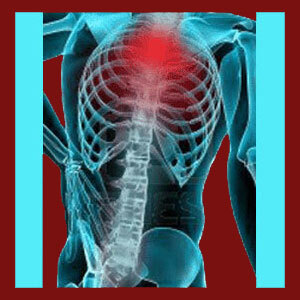 Injury can affect any region of the spine. Although the thoracic spine is very durable, it can still suffer trauma and might therefore be exposed to damage, scar tissue or other consequences that might affect the facet joints. Injuries which dislocate or fracture certain sections of the vertebral bones increase the risk to the thoracic facet joints considerably. Spinal surgery in the thoracic region can damage the facet joints. We write throughout this website that one of the major and often overlooked causes of facet joint syndrome is surgical intervention, often in an effort to resolve some unrelated back or neck pain syndrome. Structural abnormalities in the thoracic spine can certainly set the ideal circumstances for facet joint pain to occur. This is particularly true with the various thoracic-specific conditions that can change the alignment or anatomical positioning of vertebral bones in the upper and middle back regions, such as scoliosis and kyphosis. Neck injury can have collateral effects on the uppermost levels of the thoracic spine, with events such as whiplash being cited as contributory to many facet joint issues. Pain will exist locally in cases of mechanical dysfunction or small nerve compression within the joint itself. Symptoms should not extend far off the spine or upwards or downwards too far in typical facet joint syndrome diagnoses. Even mechanical pain conditions might not be as obviously linked to movement, since the thoracic spinal levels do not enjoy the same extensive range of motion as other regions of the backbone. Additionally, since much of the thoracic spine works together to achieve the range of motion that the region does enjoy, it might be difficult to pinpoint the suspected level of facet pain from physical exam alone. In cases of spinal nerve root compression enacted by osteophytes that narrow the neural foramen, symptoms will be expressed in the innervated bodily location and usually progress from pain to paresthesia to weakness and functional deficit. Patients are always warned to be sure that the clinical expectation of the symptoms matches the real expression. When these factors do not align, there is an increased chance of misdiagnosis that can doom treatment efforts before they even get underway.